Thomas Scoffin, of Whitehorse, Yukon, made history the first time he stepped onto the national curling scene in 2007 at the age of 12. That year, Scoffin became the youngest player ever to skip a team at the M&M Meat Shops Canadian Junior Curling Championships, and he’s been competing provincially and nationally ever since. 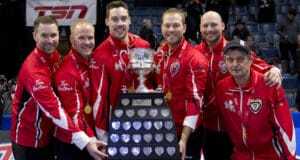 Apart from skipping the Yukon champions at the Canadian junior national event every year since then, he’s also won two silver medals (2006, 2008) and one gold medal (2010) at the Arctic Winter Games. 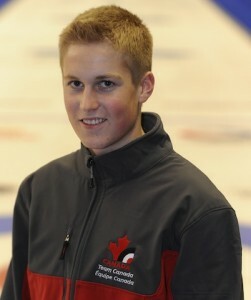 Scoffin also skipped Team Yukon at the 2007 and 2011 Canada Winter Games, drawing the attention of national curling coaches who selected him to call the shots for Team Canada at the 2012 Youth Olympic Games taking place in Innsbruck, Austria, this February. Third Corryn Brown, second Derek Oryniak, and lead Emily Gray round out the Canadian squad. Putting his experience to work for others, Scoffin volunteers as a coach with the provincial Special Olympics curling team that will represent Yukon at the 2012 Special Olympics Canada Winter Games. If you could be a star in any other sport, what would it be, and why? If you could change any rule in curling, which one would it be, and why? What music do you like to listen to before a game? Three things you always travel with? First thing on your Bucket List? What is the biggest misconception about curlers? 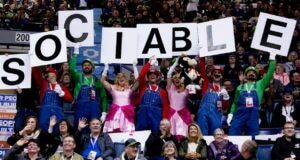 Previous: Take 5 for the Scotties in Red Deer!